Frank Addington Jr., the aspirin buster, shoots behind his back. 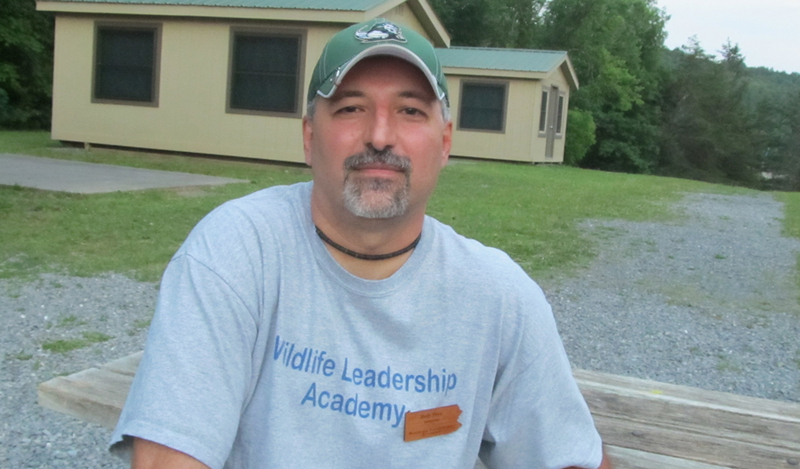 His message is threefold: spend time together as a family, do it outdoors and stay off drugs. And his vehicle for delivering it? That would be baby aspirin and a recurve bow. 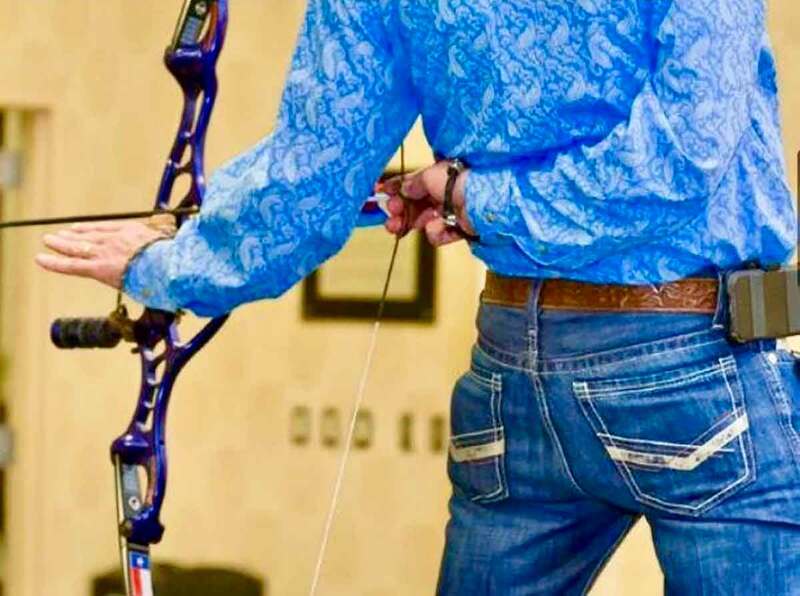 For 34 years, Frank Addington Jr. – a West Virginia native now living in San Antonio – has traveled the country doing archery shooting exhibitions. They aren’t fancy in the sense that they involve no strobe lights, no pyrotechnics, no lasers. In fact, the green mesh backstop he uses to stop his arrows now is the same one he started with almost three and a half decades ago. “I’m a big believer in, if it’s not broke, don’t fix it,” Addington said. “I do like fancy hats and boots. But it’s basically just the green net and me. But his show evolved in one other way. He shoots instinctively, with no sights. And in the beginning, his target was an aspirin tablet thrown into the air. He did. These days, he shoots aspirin out of the air, but does so firing from behind his back. And – unlike most exhibition shooters, who have a full-time thrower that travels with them — he uses a volunteer from each show site to toss the tablets. “So I never know where the pills are going to go before I get there,” he said. Frank Addington Jr. overcame physical challenges to become the aspirin buster. It’s all pretty amazing stuff for someone who got his start in archery because of a disability. He was born with a “severely sunken” chest, a syndrome called pectus excavatum. A “fairly crude” surgery performed when he was 4 largely failed to correct it. “So I was very, very limited,” he said. He has “superhuman” 20/8 vision, though, which is comparable to that of Olympic athletes in vision-dependent sports. So his answer was to go in the back yard and shoot his bow, hour after hour, day after day, pretending to be legendary archery Fred Bear. He eventually met Bear – Addington’s parents ran an archery shop, something that in time put him in contact with a lot of the early legends of the sport – and Rev. Stacy Groscup, another exhibition shooter. Adding would do shows with Groscup, throwing targets into the air for the older man to shoot. Then, one day, Groscup turned the tables and challenged Addington to shoot a Pepsi can tossed into the air. Addington hit it, on his first try, and his life’s path was revealed. “That one little deal lit me up. I knew that was what I was going to do for a living,” Addington said. He’s never been able to escape it. He’s tried a time or two, most recently after his children were born. Perhaps, he thought, he would work in sales, so as to be home more often. Being an exhibition shooter means weekends on the road, after all. “But every time, I go right back. It never lasts,” he said. The rush of performing in front of crowds, and sharing his three-fold message, is too powerful. So he travels the country week after week. He’s exhibited in 41 states, doing everything from county and state fairs to exhibitions in cities like Los Angeles and New York. He’s got six bows that travel with him. Many times, he even sends them on ahead, so that they’re waiting on site when he arrives. That’s OK, as he rarely practices or shoots outside of shows anymore. “It’s not that I don’t have to practice. I don’t want to be arrogant,” he said. “But I paid my dues. If anything, he enjoys talking almost as much as shooting these days. So-called R3 – for recruitment, retention and reactivation – are the buzzwords in the outdoor community these days. They refer to efforts to get and keep people hunting, fishing, camping, hiking and the like. Addington has been preaching that message for 34 years and still does. 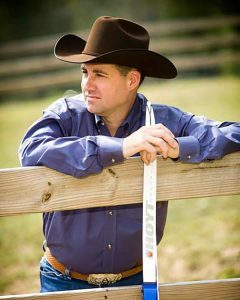 Citing names like Roy Rogers and Gene Autry, he said his goal is to be a positive influence for the children especially who see him on stage doing “some crazy things.” He preaches getting outdoors and living a healthy lifestyle. “When I was young, my experimentation was with slingshots and BB guns and bows and trying to figure out what fly to use to catch a trout. So I want to encourage families to limit their children’s screen time and keep them engaged in the outdoors,” Addington said. So you’d like to see Frank Addington perform with your own eyes? Well, that’s sometimes as tricky as one of his shots. He travels the country and does dozens and dozens of shows each year. He’ll be at the Allegheny Sport, Travel and Outdoor Show at the Monroeville Convention Center, just west of Pittsburgh, on Feb. 15-17, for example. He’ll perform all three days. He doesn’t – and never has – published a master list of where he’ll be appearing and when in any given year. He relies on those who hire him to get the word out. You can see videos of him in action, though, and perhaps even contact him to get information on appearances via his website.